Recorded in many spellings including Hassan, Hassen, Hason, Hasson, and Hassin, this is a surname which has at least three possible origins, all quite different, all from different parts of the world, and therefore largely dependant on the roots of the namebearer. As a first example it could be Gaelic, meaning either Irish or Scottish, and a development of the pre- medieval O'hosain, itself from the Norman-English name Hal or Harry, and ultimately the German-French "Henri" of the pre 10th century. Secondly it can be Islamic, where it is recorded as Hasan, Hassan, and Husayn, names associated with sons of the Prophet Ali. However hereditary surnames of Islamic origins were rare until recently, and meaningful recordings are almost impossible to find in a Romanish language. 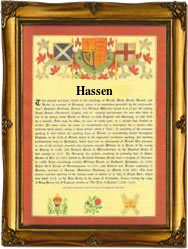 Thirdly the name could be English, and a dialectal development of the surnames Hassent or Hersent, also recorded as Assan, Asson, Hayson, and Harsent. However spelt, these all derive from the pre 8th century Anglo-Saxon "Herisint", a typical compound name of the Dark Ages, which translates as "army-truth", and therefore has no literal meaning. It is not easy to give original recordings from all the countries who might play a part in this surname. We have chosen the oldest recordings. These include John Herrsent of the county of Suffolk, England, England, in 1276, and John Hassane, a merchant of Wexford, Ireland, in 1548. The earliest recording anywhere may be that of "Hersent", in the rolls of the English Exchequer in the year 1166, during the reign of King Henry 111, 1216 - 1272.